Note: I have rebuilt my old website with a new host. The original version was somehow deleted by my previous web host during “site maintenance”! Everything is up and running again as at 8 June 2017. My name is Vicki Powys and I live in Capertee Valley in New South Wales, which is part of rural Australia. I have been recording wildlife sounds and writing about birdsong since the 1980s, and was until recently the sound editor for the Australian Wildlife Sound Recording Group. My other big interest is landscape painting. I trained at the Julian Ashton Art School in Sydney, NSW, back in the 1960s and have had many solo exhibitions since that time. Please feel free to explore my website where you can download some of my papers on birdsong, listen to wildlife sounds, and look at my paintings and photos. You can also download two of my local history books. 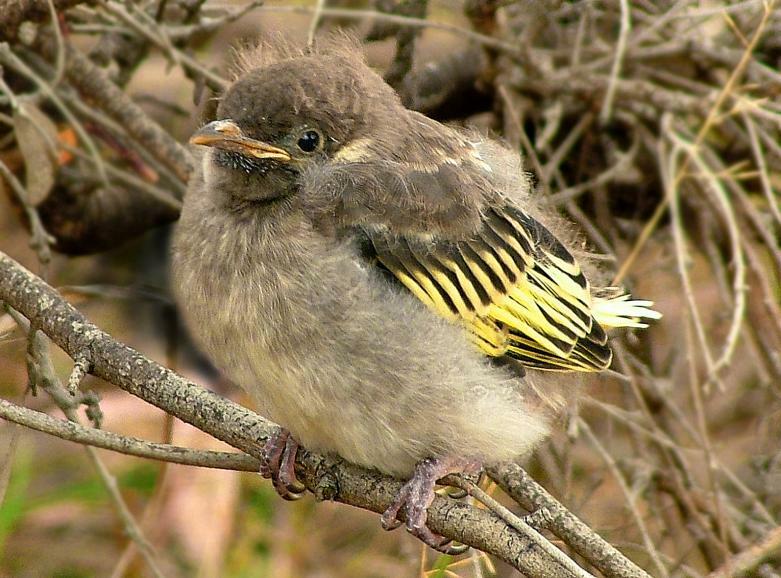 This little bird is a fledgling Regent Honeyeater on its first day out of the nest, September 2009. This species is classified as Critically Endangered with perhaps only 500-1000 birds left in the wild. Capertee Valley in New South Wales is an important breeding site for the species.